That’s what they say. Well, this was something of the reverse situation. Night before last was the third time that Barbara and I had dinner at The Industry. I had already written enthusiastic reviews of the first two — one year ago and then six months ago — in what had been expected to be an annual visit but has turned out to be a semi-annual one. The usual idea of giving any restaurant three tries, especially if it is new, is that you don’t want to judge it by one or two initial and possibly atypical experiences. This time it was the third visit that was atypical — maybe because it was a Sunday, maybe because it was August… who knows? Fortunately it wasn’t our first visit, or we might never have returned, and that would have been too bad. The food was still good, the server was friendly, so what could I possibly be complaining about? 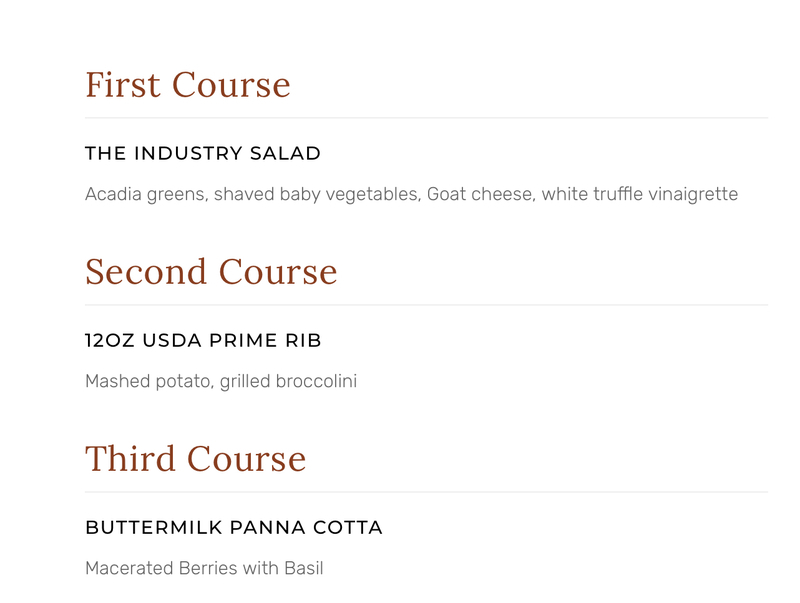 Is it simply that I expect things to be perfect if we’re paying $186.29 (including tax and tip) for dinner for two? Well, that’s a bit true, but not entirely the problem. Let me tell you, and you be the judge. Since it was Sunday, no valet parking was available — and there’s never much on-street parking in this block, so we left the house with extra time to spare. Fortunately we immediately found a parking space right across the street, and were 15 minutes early as a result. We were greeted promptly and courteously, and were seated at a nice corner table and served ice water (with not much ice). Our order for drinks was taken and fulfilled right away. So far, so good. Shortly thereafter, our server, Jeff, asked whether we were ready to order food, and we did so. Again, so far so good. After a short wait, Jeff reappeared to announce that my entree was still in the oven and wouldn’t be ready for another 30 minutes. We said that was OK. We weren’t in a hurry. Now it’s time to tell you what we had ordered. Barbara asked for steak frites (which came with a small salad) from the regular menu, and I asked for the special Sunday prix fixe menu (see image; I didn’t need to ask for any changes). You may wonder why they couldn’t have served my salad while we were waiting, and why we weren’t offered bread, or ice, or refills on the water. At least we wondered why. So we waited. Eventually my salad came. It was really good; too bad I didn’t have time to finish it. Jeff asked if we wanted bread; it arrived (warm) with EVOO, and we were asked if we also wanted butter. We said yes. Then my prime rib, potatoes, and broccolini arrived almost immediately (no butter yet). Barbara’s steak, fries, and salad showed up at the same time. I had to taste-test the fries, which were fine but definitely not hot or crisp. (Were they sitting under a heat lamp all this time?) The meats and vegetables were all excellent, with such large portions that we had to take nearly half of it home. (“Leftovers are a good thing,” as Barbara always observes.) I would have preferred the prime rib to have been on-the-bone, but it seems you can’t get that anymore anywhere. Some nice whipped butter finally showed up after we asked a second time. Meanwhile the party of four at the next table had been waiting for 15 minutes without even having their order taken. And it’s not as if the restaurant was particularly crowded. When one member of that party threatened to go elsewhere, their order was finally taken. Jeff showed up to check on how we were doing. We asked to take home what we hadn’t finished (except for what was left of the salads and fries). About 75% of our dishes were cleared. I ordered espresso along with my panna cotta (see menu above). The espresso showed up promptly, and then another server (who I think was the manager) arrived to say “Here is your chipwich.” I pointed out the dessert on the menu and said that I had asked for the panna cotta as listed, not the chipwich. Panna cotta (excellent, with a few berries), leftovers, and the check showed up promptly. All in all, nothing terrible, but basically amateur hour, especially at that price. They never quite had the pace right. Maybe Sundays in August are when new staff are on duty. Maybe they were just understaffed. But it was still disappointing for what was supposed to be a special dinner celebrating my retirement now that both my regular teaching was over (for good) and my summer teaching was over (for 2018). We’ll still return, but not on a Sunday. ‹ What happened to our rear window?